So, today is my dads anniversary. But not just any anniversary, it’s a huge anniversary. Twenty years in fact. Whilst the papers are filled with more and more reports revealing the truth about Princess Diana (yeah it happened in the same month of 1997), I’m struggling to think how on earth twenty years of my life has just gone by so bloody quickly. It’s a difficult moment, a difficult day, because I’d like to say I still keep in touch with my dad’s side of the family but I don’t. I would like to say I visit his grave often, but seeing as there isn’t one (something his family decided against), I don’t do that either. I’d like to say I kept up with any of the languages he spoke and I learnt, but I didn’t, I’d like to say I travelled the world, but I’ve only visited a few countries and I’d like to say so many other things I swore I’d do after he died, but didn’t actually do. Maybe I was scared, maybe angered that he just died from an aneurysm in his sleep. Thankfully painless as he was sleeping but it happened a few weeks after a knee operation whilst we were on holiday at my grandparents house in Ireland in the summer holidays, a few weeks before I started secondary school. Maybe it was because I just couldn’t understand how a knee operation could lead to something so sudden, to take him away after an argument we had, where words I said, regretted over and over till this moment, could lead to the bullying hell that I was to endure gave me the light that the best way to cope with it all in my adult life was to hide, mainly behind disastrous relationships, a large amount of social smoking (cigarettes) and drinking and just doing anything but adulting. But through all those years of doing things hidden behind crazy hairdo’s and social drinking, I met the best people, learnt a lot about the real ones and met Sam, my boyfriend, my other half, my rock, who gave me the best gift in the whole wide world; Emily. Ideally, I wish there wouldn’t be this moment, sitting in my living room, on a Wednesday afternoon, watching Emily bounce up and down watching CBeebies growing up without meeting one heck of an amazing man, her grandad but this moment is here. Although dad isn’t here in being, he is here in spirit. She will grow up knowing about him of course. I will tell her all that there is to know about him. His love of cheese, Brie included that I am obsessed with. His eccentric personality, that one time mum talks about when he went out for bread and milk and came home with a new antique, or the fact he couldn’t understand why mum said he couldn’t keep his MG because I, in her tummy at the time, was on the way and a sports car wasn’t safe for a new baby. He was the soul of a party, loved his music, had one of those personalities that everyone loved and made people smile. He always made people smile. I can’t believe it’s been 20 years since he’s gone, but time goes so quickly. So much has happened in those twenty years and I’m here, 31 years of age, with a beautiful daughter, loving partner, living in a town 85 miles from mum. I’ve done what my mum did 3 years before I was born, except I’m by the sea instead of living in Cambridge. Funny how I didn’t think for once that I would ever have a family of my own but here I am, I just wish dad was here to be part of it too. So whilst I haven’t done everything that I wanted to do in that time. There are a few things that I want to do, especially now that I have a family. I will be visiting Dungarvan, County Waterford in Ireland for the first time since I heard the news twenty years ago, next year. I think it’s time. Since the day mum told us, I refused at every holiday or given moment to go back. I’ve never been ready before, but now, I think I’m ready and I want to share the good memories of my childhood, where my mum’s side of the family are from with the two most important people in my life – Emily and Sam. I passed French at GCSE, yet only know a few words now, the basics. Terrible really. He spoke it fluently since a trip at school took him to France to live with a family that spoke no English, it was the language he loved the most. Seeing as half of France visits this side of Kent as we’re only 2 hours away by Channel Tunnel, I do think it’s beneficial to have a second language, and now is a good time to learn it, even if it is a little late. My dad was born in Edenbridge, Kent in December 1939, before being evacuated with his mum and sister to the South West of England during the Second World War. Funnily enough Emily was also born in Kent, it’s nice to have that little connection there. Edenbridge is an hour and a half way from here by car, so when I pass my test, it’s definitely somewhere we’d like to visit. It’s also close to Hever Castle, located in the village of Hever, once home to the Boleyn family from 1462 to 1539. If dad were alive today, he’d be 77 years old. 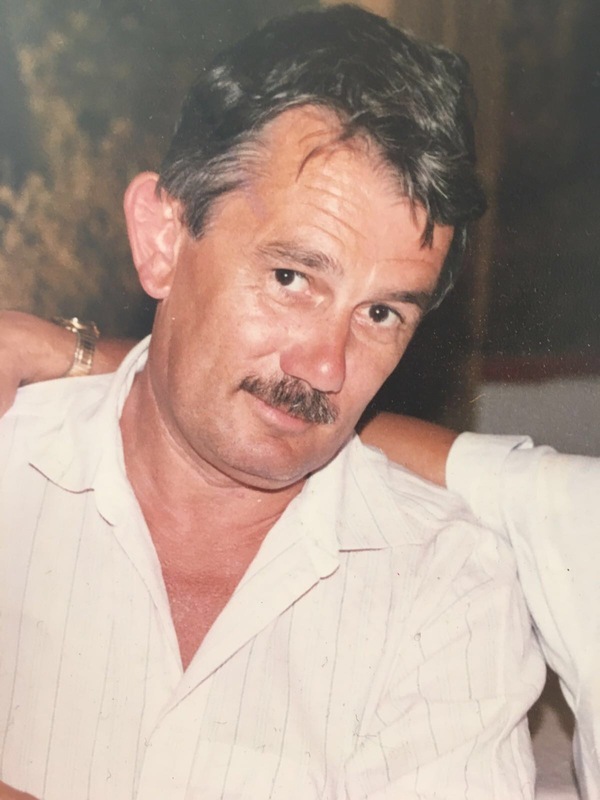 He was 20 years older than my mum and, funnily enough a year younger than my granny – bet she loved that – but he’d still be full of beans, talking the talk, travelling the world and still eating his cheese, sipping his red wine or having the occasional Calsberg Special Brew. He’d love Sam, no doubt chatting about Sam’s love of football, my dad’s dislike for it, bouncing Emily up and down on his knee and loving this moment. He’d love his two gorgeous grandchildren, Emily and Mya and even though he’s not physically here, he’s here. I know he is. I wish Emily and Mya had their grandad growing up but they don’t, but Mya hears the stories and Emily will do too. He may not have been in our lives for long but he was my dad and I’m lucky that I remember what made him laugh, his love for Terry Wogan on the radio on a Saturday morning drive back to his. That having hugs was like hugging a hot water bottle, his moustache tickling my cheek as he’d give us a kiss and say goodnight. The stories, the laughs, the giggles, the vanilla ice cream with sponge fingers and a big helping of hundreds and thousands at granny’s before getting our rollerblades on, dad driving us to the top of his road in Addiscombe and we’d laugh as we’d hurtle down at a ridiculous speed to the bottom where grazed knees and red faces were met with a big smile from dad. It’s moments like those that I don’t forget. There’s so many. And whilst these memories sometimes feel like they’re fading, we had a special bond, I’ll still remember, but they’ll spring up more and more when I see Emily with her daddy, Sam, as she grows up.